It’s our mission to create tasty, heathier snack bars that encourage people to get outside, get active and explore their own Wild Trail… whatever or wherever that may be. We believe it’s important for us to be a clean-label brand so that people can easily read our ingredients list and understand each item. We don’t want to make products with endless ingredients lists full of scientific-sounding names that leave people scratching their heads! That’s why we vowed to keep it simple - five natural ingredients in each of our bars. Full stop. That’s it! 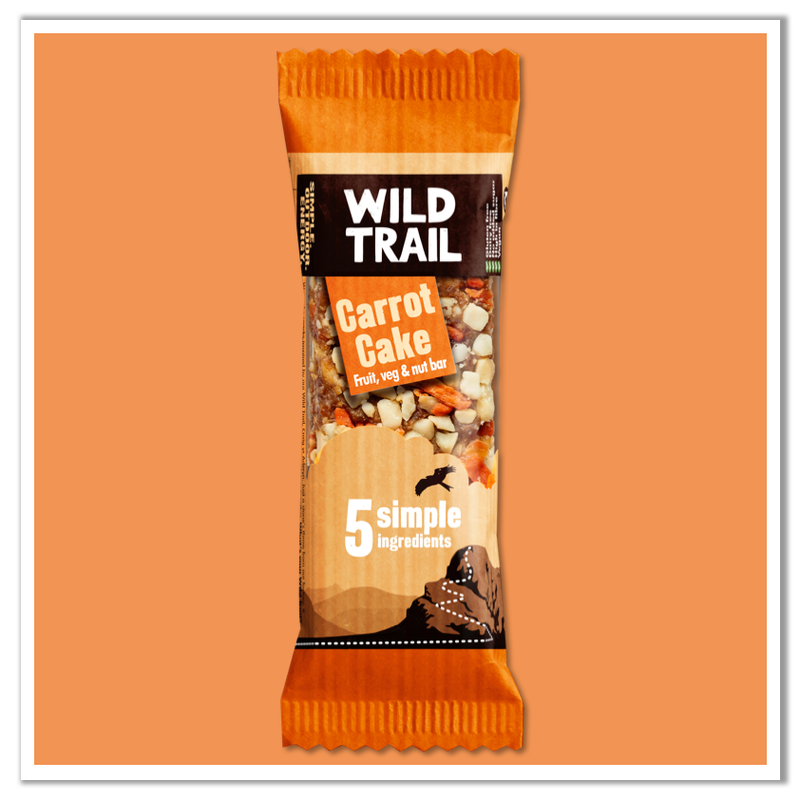 Inspired by Snowdonia and based on traditional trail mix recipes, we want to energise people using natural ingredients that offer great taste and texture. Our bars are built to fuel your adventures by giving you a nutritionally balanced snack that provides SIMPLE. OUTDOOR. ENERGY. Our mix of ingredients gives a quick energy burst through the natural sugars from the fruits but then enables slower release energy from the nuts and oats. We’re proud to say that all our bars score extremely well on the Department of Health’s Nutrient Profiling scoring, which measures the nutritional value of foods. Hurrah. Our scrumptious fruit and nut bars currently come in four flavours. We use raisins in all our bars (as we think they offer better texture and balance) as well as oats and peanuts or cashews. Our Apple bar gives a bit of a tang from its red apples pieces, while our Seed & Nut bar is topped with wholesome pumpkin seeds. Then there’s our Cacao bar, with the richness and bitterness of dark chocolate, or our Carrot Cake bar, with a hint of cinnamon and real carrot pieces. Whatever your taste, we think we’ve got something for you! Check out our full range in our webshop. Yum! We recognise that it’s just as important to consider what’s not in our bars versus what is in our bars! We also want as many people as possible to be able to enjoy our bars. That’s why we’ve created a range of snacks that’s gluten free, dairy free, vegetarian and vegan, high in fibre and with no added sugar. However, whilst we might be free from many things, we’re certainly not free from great taste and texture… we’re packed full of it! So if you’re after a healthier snack, but have certain dietary needs, then we might just give you the solution you need! Where’s the goodness? Well… where to start!? Pumpkin seeds are packed full of protein, magnesium and zinc – all essential for high energy levels. Cacao is an antioxidant and peanuts and cashews are a good source of Vitamin E – helping protect the body from toxins. Raisins are rich in iron which helps increase the blood supply in the body and oats are among the healthiest grains on earth. Carrots help you see in the dark* and Apples keep the doctor away* (*possibly not true but it’s what everyone’s Gran used to say!). Also, on average across our range, almost 90% of the fats in our bars are unsaturated (aka ‘good fats’) and we’re also high in fibre (which can help control cholesterol). Not bad, eh? If you’d still like to find out more about our bars then have a browse of our FAQ page for answers to a whole range of questions on topics such as provenance, ingredients, production, packaging and more! We could talk about our bars all day (after all, we’ve got the energy) but rather than just believe what we say, why not see what other people have said too? From office workers, casual hikers and parents packing lunches, to extreme mountain bikers, brave ironmen and intrepid explorers… we’ve had a big thumbs up from all kinds of people.